Fast telephoto zoom lens for low-light, sports, wildlife, concerts, weddings, portraits and everyday shooting. The AF-S NIKKOR 70-200mm f/2.8E FL ED VR produces images that have a life of their own. Six ED glass elements, Fluorite (FL) and High Refractive (HRI) lens elements and Nano Crystal Coat (N) all but eliminate distortion and glare and maximize contrast and sharpness, even in difficult backlit situations. The constant f/2.8 maximum aperture produces beautiful, creamy background blur, and the masterful design and construction ensures this lens will be a legend. 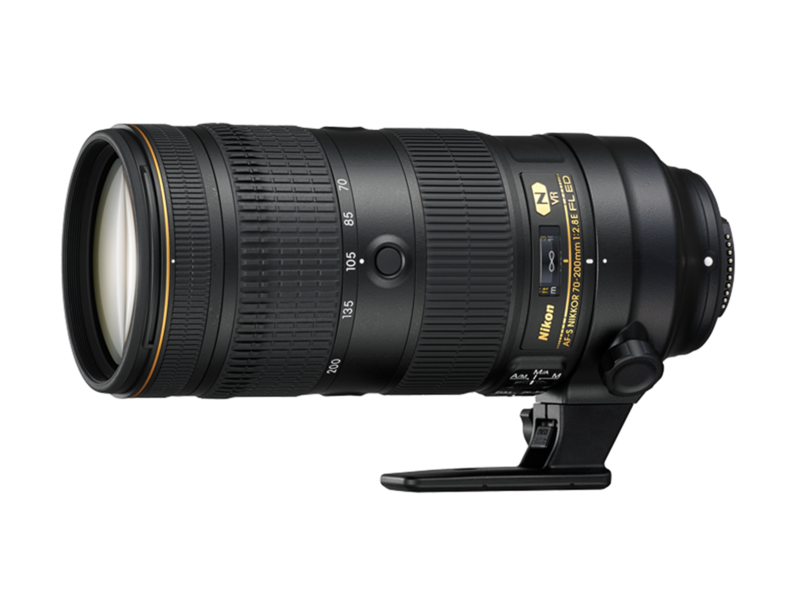 The AF-S NIKKOR 70-200mm f/2.8E FL ED VR has four focus function buttons right on the lens barrel, perfect for engaging autofocus or AF Lock*. The zoom and focus rings have reversed positions for more comfortable, stable zooming. Its magnesium alloy barrel, High Refractive Index (HRI) lens element and lightweight Fluorite (Fl) element located near the front of the optical group keep the lens evenly balanced. The tripod collar ring spins on ball bearings for smooth transitions between horizontal and vertical shooting. Shoot with the aperture wide open at f/2.8 across the entire zoom range?from 70mm to 200mm?for sharp, bright images with smooth, creamy background blur. Close focus has been improved from 4.6 feet (1.4m) to approx. 3.6 feet (1.1m), allowing for stunning close-up portraits. Combined with a high-ISO Nikon DSLR,the AF-S NIKKOR 70-200mm f/2.8E FL ED VR opens new possibilities for capturing indoor sports, wildlife at dusk and dawn, wedding receptions and so much more. You don't get a second chance to capture the decisive moment, and weather conditions rarely cooperate. The AF-S NIKKOR 70-200mm f/2.8E FL ED VR is designed for exactly these moments. An all new weather-sealing design ensures you can keep shooting through nearly any condition. Every movable part of the lens barrel?nine parts in all?are extensively sealed for dust and water drop resistance. Additionally, the front lens element is coated with Nikon's non-stick Fluorine coat, resisting dirt, fingerprints and smudges. Camera movement during exposure robs sharpness. It's that simple. Nikon's VR image stabilization has ben enhanced from 3.5 stops to up to 4.0 stops**, a must-have feature when working hand-held, on a monopod or even a tripod. A specialized Sports Mode is optimized for camera pans and fast-action sports, and the Tripod Mode eliminates the subtle ground vibrations that are constantly passing through a tripod or monopod. Capture subjects with outstanding sharpness, even in low light. During high-speed continuous shooting with a fast DSLR like D5 or D500, the lens' electromagnetic diaphragm syncs with the camera shutter for remarkably consistent exposure, even with a teleconverter. AF tracking is improved, too, especially for notoriously difficult subjects: those with unpredictable or very slow movement, those moving at random speeds and those approaching the camera at high speed. Nikon's Silent Wave Motor (SWM) powers ultra-fast, near-silent internal focusing (IF) with no breathing effect across the entire zoom range. 88.5 �x 202.5 mm / 3.4 x 7.9 in.